I have no more words about this print. If you want to know some of the background, you can see previous posts about the murder of my friend Joe or about the things I discovered in researching other murders of lesbian, gay, bisexual, and transgendered people. I'll leave you with a poem for Matthew Shepard written by Karen Bashkirew. I became familiar with this poem through an album by Suzzy and Maggie Roche called Zero Church. we can't begin to imagine. we send chasing after it. A sound goes on and on and on. are streaking through space forever. They say that Leonardo Da Vinci may have painted himself into “The Last Supper,” not once but twice, so I'm in good company. I carved myself into this depiction of the mourners of the Thirteenth Station. I've never done an overt self-portrait in my work before. That's me, wiping away a tear, crying for my friend Joe Kelly. I modeled the figure on one of “The Mourners,” a collection of 15th century alabaster tomb sculptures from France that I saw a couple of years ago at the Metropolitan Museum in New York. I think Ty The Yellow Lab wanted his portrait in this print, too. Added later: Friends on Facebook have suggested that Ty may have been trying to hide out after surreptitiously imbibing from the bowl. Quite possible. Using a different gray, I printed the shapes of the mourners' bodies with just a few highlights carved out. I like when the season I'm working in matches the subject matter of a print. In this case, I'm making an image of Christ during the season of Lent, when Christians focus on the death and resurrection of Jesus. Since I don't normally observe Lent in the traditional way (giving up something for the month), I'm enjoying observing it in my art. I grew up Protestant, but in the Roman Catholic church (and a few others too, I think) there's a Lenten devotional practice that revolves around a series of artistic representations called the "Stations of the Cross." These representations are often sculptural, and each one depicts an event in Christ's crucifixion and death. The scene I'm reproducing for this print is the Thirteenth Station, when Jesus' body is taken down from the cross and given to his mother and a few disciples. These are the mourners, and as I worked on this print about hate crimes against gay people, I was very much thinking about we who are left behind to grieve. As you can see, I've removed the shape of Jesus' body so that the names of the murdered GLBTQ people can show through. Reduction of block (second carving) in progress. I printed the lettering today. I think you can already see where I'm going with this. About a month ago I got an email from an art director at Utne Reader asking for usage rights to three pieces from my Loaded series (about money) for their March-April 2013 issue. I was delighted to say yes, and this week the issue came out. My prints were used in an article about local economies. It's an interesting twist for me, because during my entire 20-year career as an illustrator I never got a gig with Utne, even though I sent them promo pieces whenever I did a mailing. They came looking for me this time, and they found me because they were looking specifically for art about money. In the illustration world, selling usage rights to art that already exists is referred to as a "stock art" sale, and it stands in contrast to a "commission," where the artist is asked to create a work specifically for a given story. As you can probably guess, pricing is higher for commissioned work. When I was illustrating, almost all of my work was commissioned. I don't know for sure because I'm out of the loop now, but I suspect that at this point in the history of publishing most publications are using stock art as much as possible to keep costs down. At any rate, I'm happy about the potential visibility in having my work reproduced in this issue. 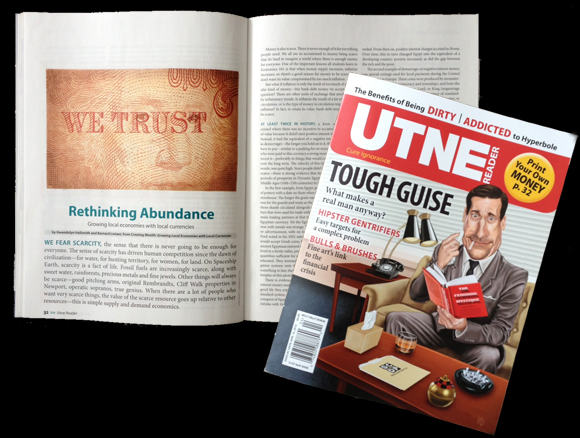 Thanks, Utne Reader! You might have heard that New England had a blizzard this past weekend. Sometimes I get a lot of artwork done on a snow day, but in this case there was too much shoveling and digging that needed to be done for it to become a studio extravaganza. Today my muscles are sore, so I'm glad my task at hand is carving and not printing, as printing can be physically strenuous. In my research for this print, which is a tribute to LGBT people who have been murdered in the past 30 years or so, I found 33 names to use. Thirty of those names were derived from Google searches. These are mostly the well-publicized murders, like the killings of Matthew Shepard and Brandon Teena. The other three murders are ones that affected me directly -- the killing of my friend and neighbor Joe Kelly (see previous post) and the murder shortly afterward of a lesbian couple named Martha Alsup and Susan Galvin who were well known psychotherapists in Boston and friends of a friend (you can find a short article about their murders here). The fact that I have personally known of three gay people being murdered who do not appear in Google searches would lead me to believe that there are hundreds, if not thousands, of others. Because I want to truly honor these individuals, I made sure that rather than just list their names I studied their stories a bit. I read the details of each death, and some of the information that came to light about their killers as well. It was difficult work, compounded by the fact that my spouse was away on a nine-day business trip while I was doing the research, so I was home alone. I had to be careful how much I read in one sitting and how late at night I continued to work. It was scary. I prayed a lot. Lesbians seem to be often killed as couples, much more often than gay men. Of the six lesbians in my list, four were killed as a couple. A fifth was attacked with her partner, but the partner survived. Only one lesbian in my list was alone. Of the 33 murders listed, only one was carried out with a gun, which was the Harvey Milk murder. I find this very interesting. The Milk murder could properly be called an assassination, and in America we do assassination with guns. All of the other murders were carried out either by stabbing, beating, or a combination of both. "Crimes of passion" I think they're called; close and intimate and personal. All 33 of the murders I've listed were committed by men. Another thing I discovered, which I didn't know before, is that on the internet there's a big argument about whether or not crimes like this can really be called "hate crimes" and whether or not we can really know that they were motivated by the victim's gender or sexuality. People who disagree with giving gays special rights or special treatment have made arguments about some of these specific cases, trying to prove that the killers' motives were robbery or drugs or anything but bias against homosexuals and transgendered people. Defense lawyers, too, try to disprove anti-gay bias by similar arguments. Lawyers have also come up with a quasi-psychological condition called "gay panic," used especially in cases involving transgendered people, which posits that a man can become temporarily insane when he realizes he's face to face with a gay/queer/trans person and he can't help but attack the person. The fact that this line of reasoning can actually be taken seriously in a court of law blows my mind. Suffice it to say, I'm glad to be done with my research. I'm using this time spent carving to offer my love and blessings to all these persons who have died from hate and ignorance and fear. And may I be relieved of my own hate and ignorance and fear, because of course I have them too.